The size of a collector array depends on the cost, available roof or ground area, and percent of the thermal load required to be covered by the solar system. The first two parameters are straightforward and can easily be determined. The last, however, needs detailed calculations, which take into consideration the available radiation, performance characteristics of the chosen collectors, and other, less important parameters. For this purpose, methods and techniques that will be covered in other chapters of this book can be used, such as the /-chart method, utilizability method, and the use of computer simulation programs (see Chapter 11). FiGuRE 5.27 Schematic diagram of a liquid system with an external heat exchanger between the solar collectors and storage tank. 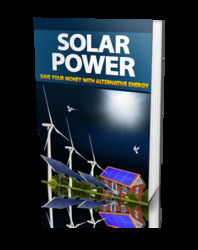 It should be noted that, because the loads fluctuate on a seasonal basis, it is not cost effective to have the solar system provide all the required energy, because if the array is sized to handle the months with the maximum load it will be oversized for the months with minimum load. The function of a heat exchanger is to transfer heat from one fluid to another. 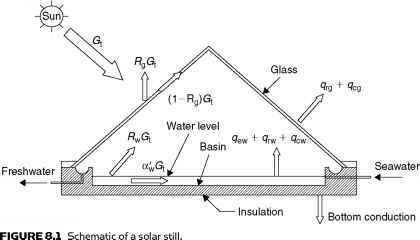 In solar applications, usually one of the two fluids is the domestic water to be heated. In closed solar systems, it also isolates circuits operating at different pressures and separates fluids that should not be mixed. As was seen in the previous section, heat exchangers for solar applications may be placed either inside or outside the storage tank. The selection of a heat exchanger involves considerations of performance (with respect to heat exchange area), guaranteed fluid separation (doublewall construction), suitable heat exchanger material to avoid galvanic corrosion, physical size and configuration (which may be a serious problem in internal heat exchangers), pressure drop caused (influence energy consumption), and serviceability (providing access for cleaning and scale removal). External heat exchangers should also be protected from freezing. The factors that should be considered when selecting an external heat exchanger for a system protected by a non-freezing fluid that is exposed to extreme cold are the possibility of freeze-up of the water side of the heat exchanger and the performance loss due to extraction of heat from storage to heat the low-temperature fluid. The plus sign indicates that only positive values should be considered. (m cp )min = smaller of the fluid capacitance rates of the collector and tank sides of the heat exchanger (W/°C). Tco = hot (collector loop) stream inlet temperature (°C). T = cold (storage) stream inlet temperature (°C). For heat exchangers located in the collector loop, the minimum flow usually occurs on the collector side rather than the tank side.